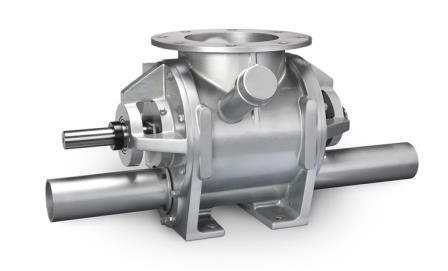 If your materials are into catching some major air, ACS BT Series valves can help ensure that you’re still maintaining your optimal material feed efficiency. We’re talking about fine powders, flakes, and other materials that can easily over-aerate. BT Series valves are built with 12-vane rotors and a blow-through adapter at the outlet flange to decrease excess aeration of material. A vent on the return-side of the rotor discharges leaked air and reduces blow-by, while outboard bearing design isolates bearings from damaging materials and contaminants. Valve housings are cast in North America and are CNC-machined to precise tolerances, eliminating axial shaft movement and seal leakage. These valves can be used in high-temperature applications (up to 500°F) and can handle pressure differentials up to 20 psig. BT Series valves come in stainless steel or cast iron with 8- or 10-in. flange sizes.